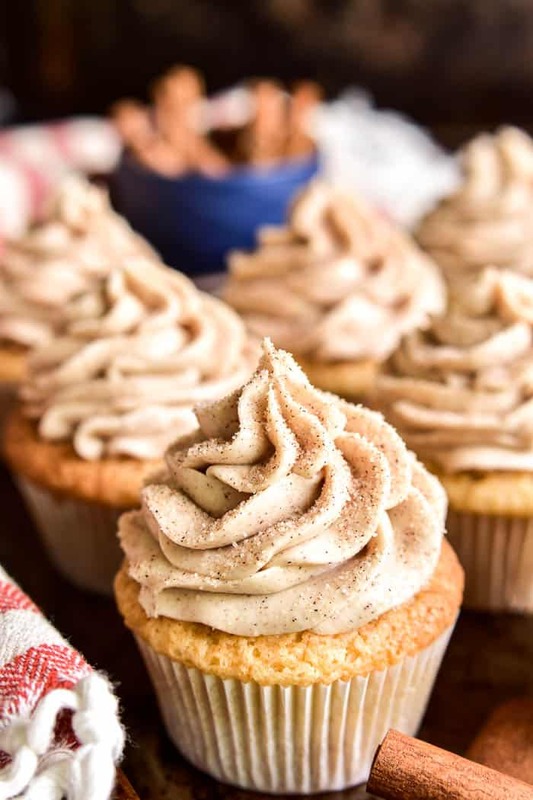 These Churro Cupcakes will blow your mind! 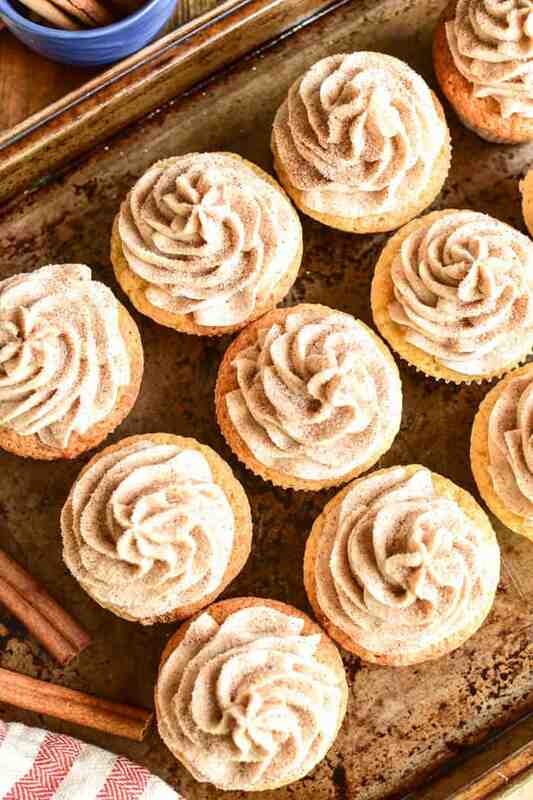 Deliciously moist vanilla cupcakes topped with rich cinnamon cream cheese frosting and sprinkled with cinnamon & sugar. Perfect for Taco Tuesday, Cinco de Mayo, or just because…. 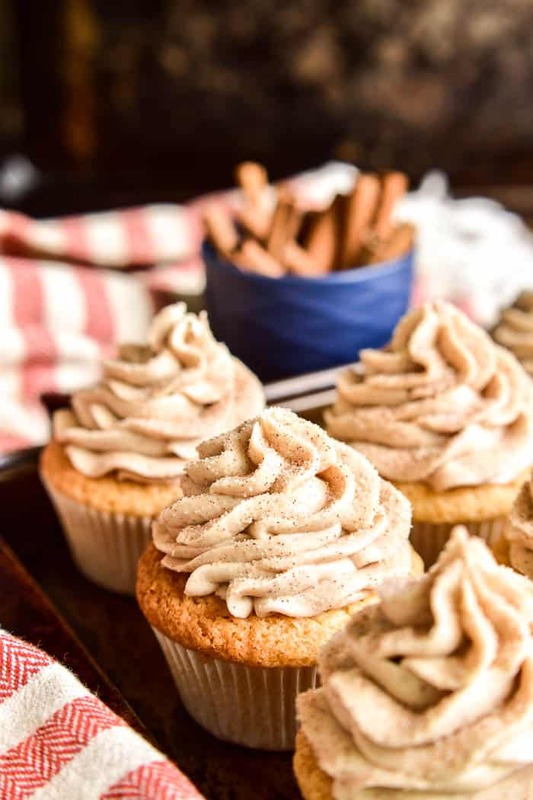 if you love churros, you’re sure to love these easy, delicious Churro Cupcakes! Churros!!! What’s not to love!? They’re thick and chewy and sweet and fried…and totally covered in a delicious cinnamon sugar mixture. But. A few things about them. Making them at home involves frying (not always my favorite) and finding them in stores is nearly impossible. Which is why churro-inspired desserts are totally the way to go! 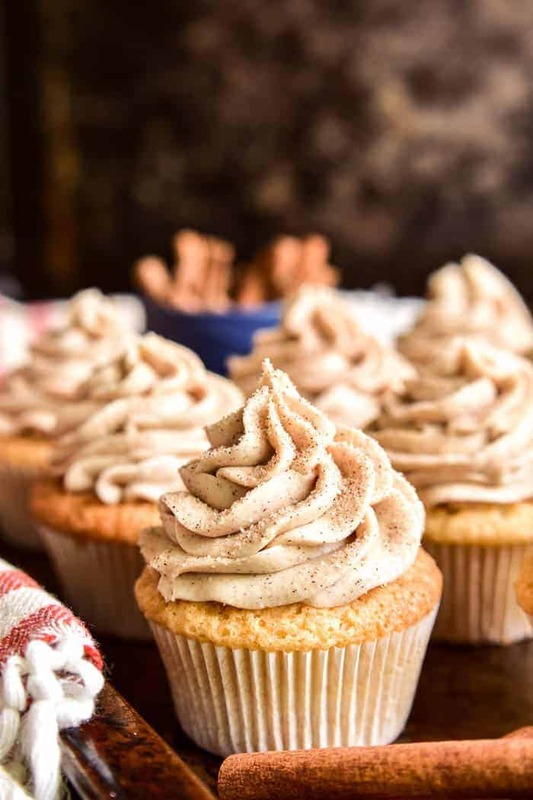 And when it comes to churro-inspired desserts, these Churro Cupcakes are our absolute favorite. Between the vanilla cake and the cinnamon frosting and the cinnamon sugar topping, they have all the flavors you expect out of a churro dessert. And they’re SO much easier than the real thing! These cupcakes start with my favorite cupcake recipe, complete with the cream cheese frosting my whole family loves. And let me tell you….there’s something about the addition of cream cheese that takes these Churro Cupcakes to the next level! Whether you’re hosting a Mexican-themed party, looking for a fun Cinco de Mayo dessert, or just obsessed with churros like me…you’re sure to fall in love with this recipe. HOW DO YOU MAKE CHURRO CUPCAKES? In a large bowl, beat eggs and sugar until thickened and lightened to a cream color. Add the oil and vanilla and mix until blended. Mix in the sour cream, then the flour mixture. Blend until batter is smooth. Pour into cupcake tins and bake, then cool on wire racks. Once cool, frost with cinnamon cream cheese frosting and sprinkle with cinnamon and sugar. HOW DO YOU MAKE CINNAMON CREAM CHEESE FROSTING? In a large bowl, beat butter, cream cheese, and vanilla on low speed until smooth. Add powdered sugar and cinnamon and mix until smooth. Scoop frosting into an icing bag and decorate cupcakes as desired. CAN I SUBSTITUTE BUTTERCREAM FROSTING IN THIS RECIPE? Yes, you can absolutely substitute buttercream of any type of frosting you would like. Just add 1-2 tsp. of cinnamon to your favorite recipe and sprinkle with cinnamon and sugar. Don’t skimp on the creaming process! Take 2-3 minutes to cream the eggs and sugar before adding other ingredients. Measure the flour by spooning it into a measuring cup and leveling it off with the edge of a knife. Don’t scoop it! Once you add the flour mixture, mix the batter just until it’s combined. Do not overmix. Fill cupcake tins 2/3 full. Do not overfill. Use room temperature butter and cream cheese for the frosting. Cold ingredients won’t mix properly, and warm ingredients won’t have the right consistency. For the best results, use a piping bag and tip. In a pinch, you can use a heavy ziploc bag with the corner snipped. 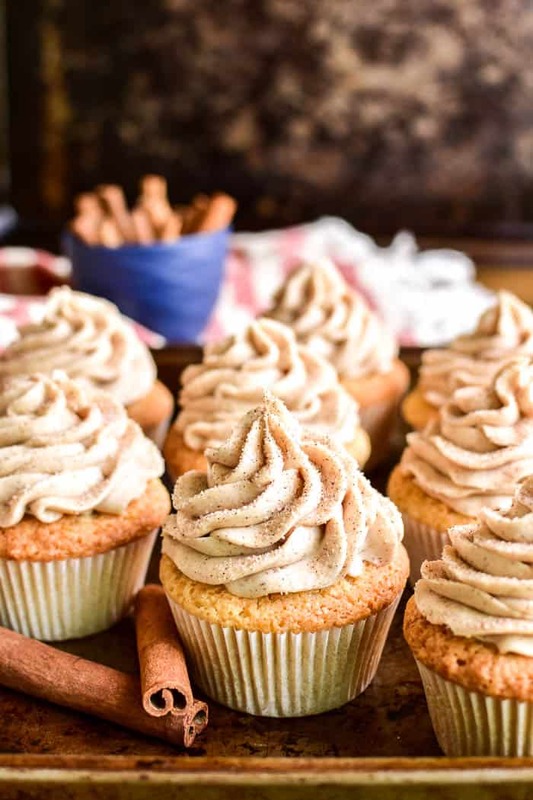 These Churro Cupcakes will blow your mind! Deliciously moist vanilla cupcakes topped with rich cinnamon cream cheese frosting and sprinkled with cinnamon & sugar. Perfect for Taco Tuesday, Cinco de Mayo, or just because.... if you love churros, you're sure to love these easy, delicious Churro Cupcakes! Pour into 24 regular size muffin tins lined with cupcake liners. Prepare frosting by combining butter, cream cheese, and vanilla in a large bowl. Beat on low speed until smooth, about 1 min. Add the powdered sugar and cinnamon, mixing until smooth, about 1 min, then beat on medium speed for 1 min. to lighten frosting. Spoon into a piping bag and frost cupcakes as desired. Doesn’t get much better than churro flavored cupcakes! Sounds like my kind of treat; excited to make these! These are a dream! Need to make a batch now! Oh my goodness! I am drooling over these cupcakes! I want some! These are adorable and I know they must taste amazing too!